Decorating on a budget sometimes seems like this mysterious unicorn that other people tell you about but you’ve never seen for yourself. Am I right? In the past I’ve spent way too much on decorating only to be completely sick of items I bought only months later, money wasted. 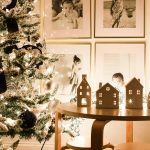 While to me, decorating is not a science, it does seem like somewhat of a craft that requires practice and all of that trial and error isn’t always in the budget. 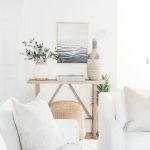 I get it but there are budget decorating ideas, tricks, and tips that will keep you from spending all your money while also curating a home you love. 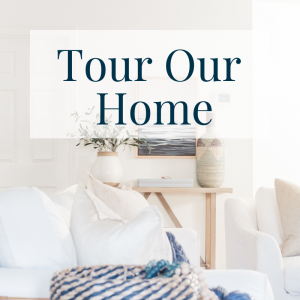 If you’re like me, you might see gorgeous rooms on the web and think “oh how stunning” and then immediately think, “yikes!” when it comes to the price tags. 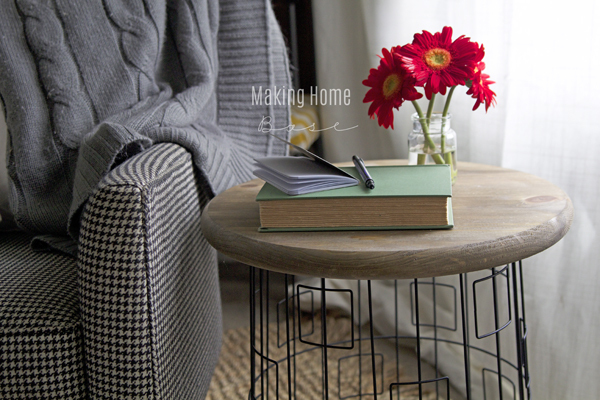 In my experience, spending money on decor for the home can feel binding. Like, if you spend this amount of money you are stuck with that piece forever and ever amen. Remember my brown sofa saga? I bought a large brown sectional for lots of dough and just a couple years later I was so over it I was doing anything to try to change it, distract from it, and then I finally ditched it for a $200 sofa. What I learned from all of that is, spending less money allows you more freedom in decorating. Budget decorating keeps you from feeling held back. Your space can change and evolve and you aren’t required to look at that ugly expensive sofa for the rest of your life! DIYing stuff for your house is my number one tip for budget decorating. 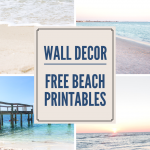 Build furniture, make pillows, make wall art, the options here are endless. You might be required to think outside of the box but you are almost guaranteed to save money if you make something instead of buying it. 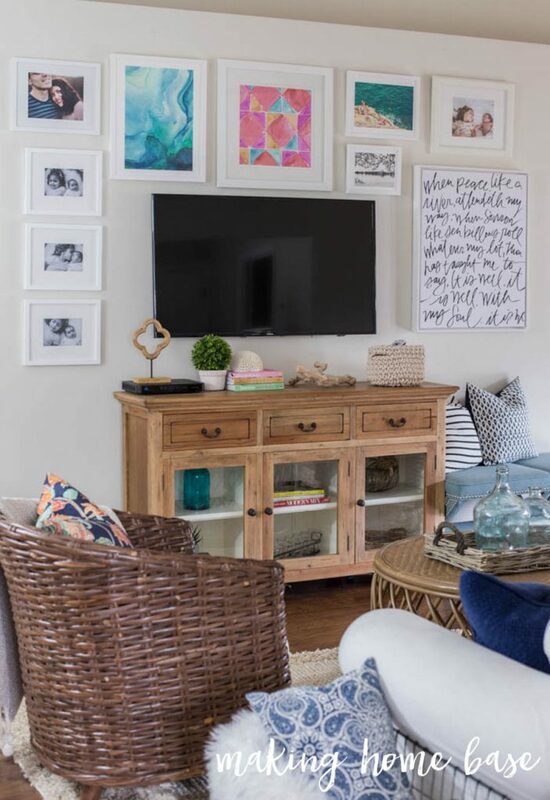 Large wall art can carry a hefty price tag, like $200+! Way out of my price range for sure. When I needed some large wall art over my sofa, I decided to try my hand at making my own. 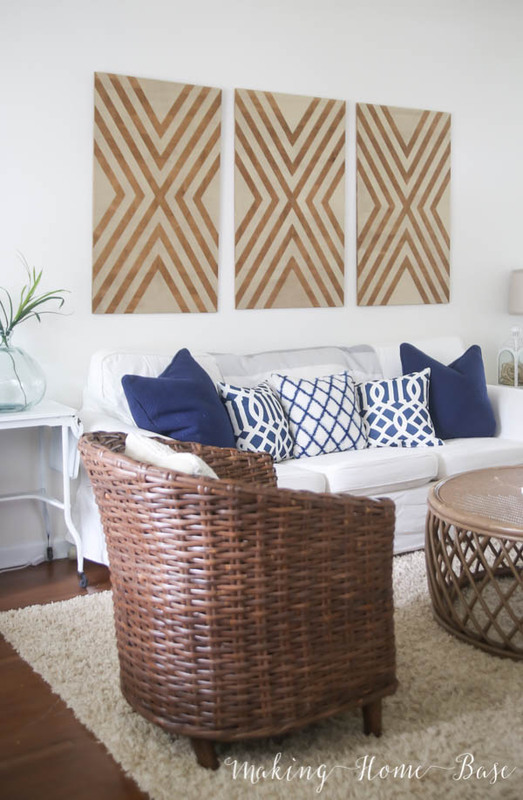 I made oversized wall art using plywood and paint to create one of a kind statement pieces for above my sofa. Oversized wall art is a great option for large blank walls. This is an especially great option for rental homes. I was able to make my DIY wall art for only $40 for all three pieces. That’s a complete steal when you consider how expensive large pieces of art can be. 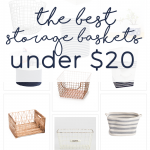 Thinking outside of the box (or basket as it turns out) is a great way to decorate on a budget. I made a side table by using a laundry basket I found on clearance, turned it upside down and added a round top to it. For only $24, I had a one of a kind piece for my space. Don’t limit yourself when it comes to decorating on a budget. All options are open to you as long as you are willing to get a little bit creative. 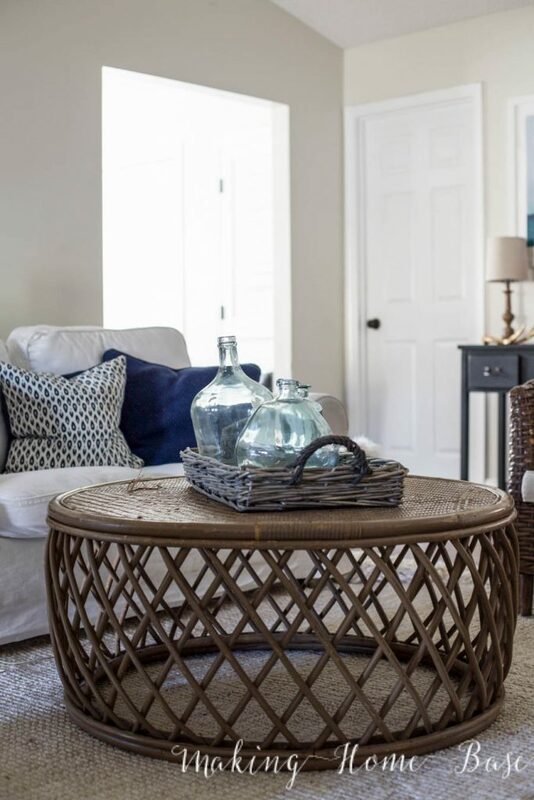 Think about how you can use items in different ways – that will allow you to transform something like this basket into a table! It’s no secret that you can save big money when you buy something second hand. What does seem to be a secret is how much great stuff you can buy second hand. Vintage shops, Good Will, Craigslist, Facebook resale pages, the neighbor’s curb – you can find some great stuff that is awesome as is or just might need a little TLC. My tip for thrifting is to have somewhat of an idea of what you are looking for. I’ve been suckered into buying randoms that I think I can’t live without and then they end up sitting in my garage for a year. Staying on task will save you money and space in your garage. After I finally made the decision to ditch the brown sectional, I found a white slipcovered sofa on Craigslist, for $200. I bought a new slipcover for it and it was like brand new. I’ve purchased tons of things from Craigslist but that sofa and my current coffee table are my favorite. I bet you have stuff in your home right now that you could spruce up! My favorite thing to “spruce up” is furniture! 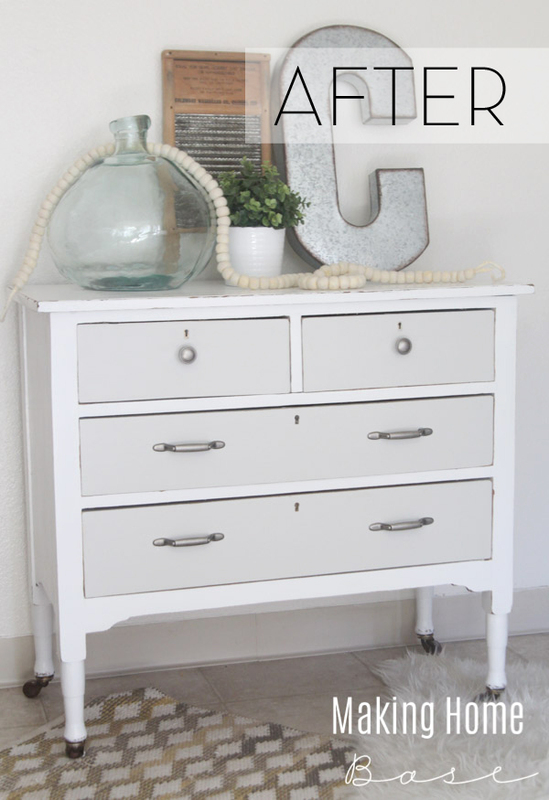 Slap some paint on an old piece of furniture and you’ve just given it a second lease on life. You can also take this opportunity to shop your house and if there is anything that isn’t working in one space, try it out in another. I recently moved a cake plate from my kitchen into my office and I’m using it to hold random desk items. You may want a quality piece of furniture or a statement piece of some sort be it art or lighting or whatever your design eye finds. Decorating on a budget doesn’t mean you have to have a home full of hand-me-downs. It means you spend your money wisely! Once you identify the item(s) you want to splurge on, do your research. If you absolutely love an upholstered bed from an expensive furniture boutique, make sure you look around. Search online retailers to see if you can find something similar for cheaper. Ask local retailers about upcoming sales. Just because you intend on splurging doesn’t mean you have to. Planning in decorating can save you bundles. Sort of like meal planning saves you money on food – planning out your decor projects can help you stay on budget. Writing down everything you have, everything you need, and the items that you are searching for will not only keep you focus when shopping but it will also keep you from getting distracted with the shiny new trends. This is the worksheet I use to plan my decorating projects. 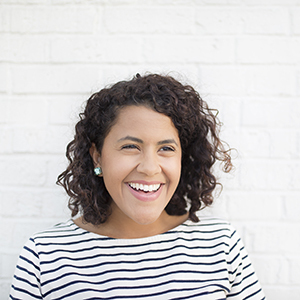 I hope these tips can help you hone in what decorating on a budget means to you! Happy decorating! 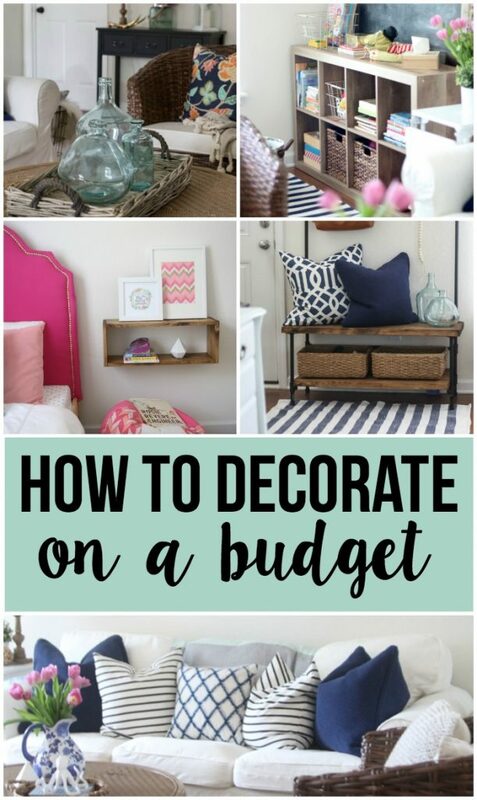 Loved this post … Totally needed this right now to know that I’m not alone when it comes to decorating on a budget. I’m constantly budgeting and decorating on a limited income so thank you for your wonderful and creative ideas. My problem is that I truly like something, buy it and within a few days/weeks, I wonder why in the world I ever bought it. I constantly change my mind. I need help knowing how to center in on a design and sticking with it. Hi Dee – this a great question and honestly something I used to really struggle with. I never had a cohesive look so I just bought things that I loved (or thought I loved) and went with it. Soon I ended up with a garage full of stuff I was ready to get rid of because I was constantly changing my mind. I think the key for this is to really figure out your personal style. To do that, I like to spend some time gathering tons of inspiration, look everywhere – Pinterest, mags, tv, outdoors, your own home, your neighbors house, model homes, stores you frequent – take a mental note (or physical note – take photos or save images) of all the things that are similar – for example mine would probably be lots of blues, wood tones, neutral paints, nautical accents etc. Then if you feel inclined you can put a name on your “personal style” – you can do this by describing those commonalities in three or four words – so I might call my personal style – relaxed classic coastal. My biggest advice is to try to stay away from trends, which I know can be tough. 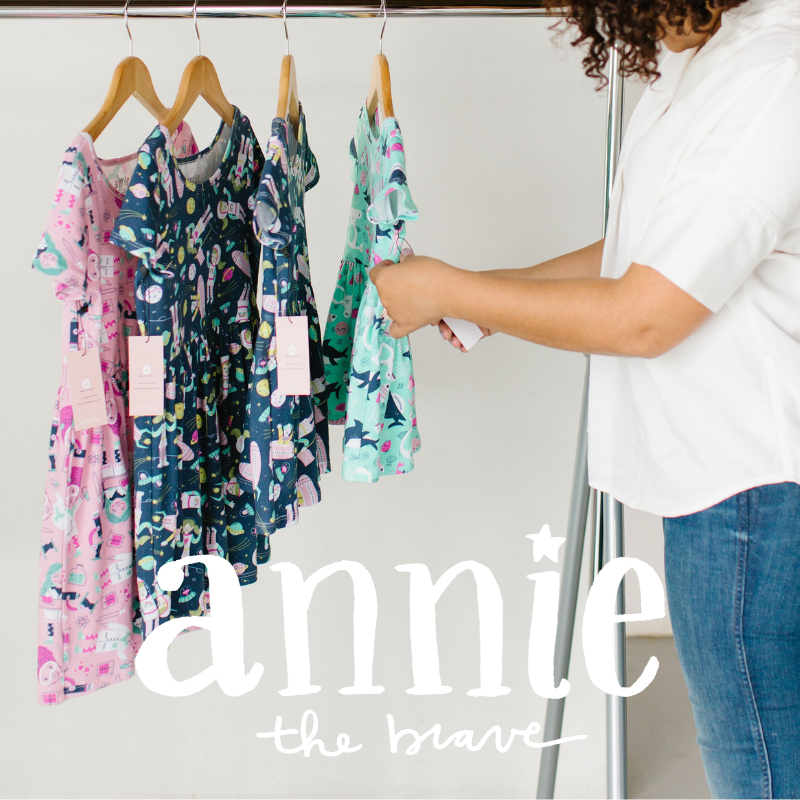 Those big box stores (looking at you Target) come out with a new line of beautiful trendy items every other month it seems and it’s so tempting to jump on board – stick to your “style” and try to only purchase things that go along the descriptors you have already identified. I hope that helps! I’ve got a lot more to say on this topic so stay tuned friend! Dee, my advice is if you really want something, get a picture of it. Put the picture as close as possible to where the item is going to go. If you can blow the photo up even better. Live with it a week. Put the photo away for a week, don’t look at it, think about it. Week 3 get out photo, still want it? Sure? Then get it. If it’s truly right then chances are it will still be there. This doesn’t apply to things you’ve dreamed off, planned for forever. It does help cut down impulse buying and later regrets. not on my usual list. That’s a great idea, Lucy! Perfect to keep you from those impulse buys! Great post, really love your ideas and your style! !